This is the Rehabilitation Project Force Technical Program. It has been written in strict accordance with the LRH references on tech handlings for the RPF. The RPF provides the means by which those who have been destructive on post can fully redeem themselves, thus regain their self-esteem as productive and contributing Sea Org members, this technical program has been compiled to facilitate exactly that. 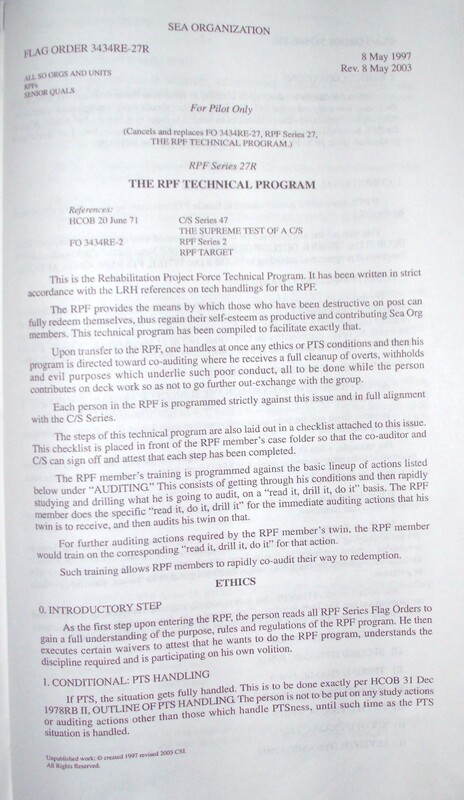 Upon transfer to the RPF, one handles at once any ethics or PTS conditions and then his program is directed toward co-auditing where he receives a full cleanup of overts, withholds and evil purposes which underlie such poor conduct, all to be done while the person contributes on deck work so as not to go further out-exchange with the group. Each person in the RPF is programmed strictly against this issue and in full alignment with the C/S Series. The steps of this technical program are also laid out in a checklist attached to this issue. This checklist is placed in front of the RPF member’s case folder so that the co-auditor and C/S can sign off and attest that each step has been completed. The RPF member’s training is programmed against the basic lineup of actions listed below under “AUDITING.” This consists of getting through his conditions and then rapidly studying and drilling what he is going to audit, on a “read it, drill it, do it” basis. The RPF member does the specific “read it, do it, drill it” for the immediate auditing actions that his twin is to receive, and then audits his twin on that. For further auditing actions required by the RPF member’s twin, the RPF member would train on the corresponding “read it, drill it, do it” for that action. Such training allows RPF members to rapidly co-audit their way to redemption. As the first step upon entering the RPF, the person reads all RPF Series Flag Orders to gain a full understanding of the purpose, rules and regulations of the RPF program. He then executes certain waivers to attest that he wants to do the RPF program, understands the discipline required and is participating on his own volition. If PTS the situation gets fully handled. 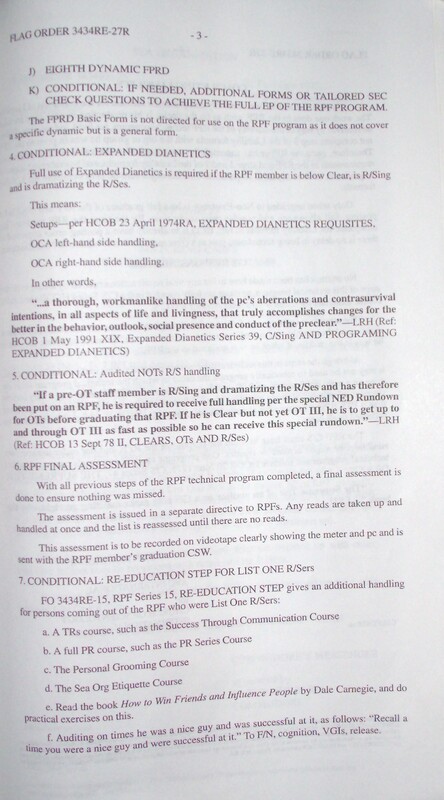 This is to be done exactly per HCOB 31 Dec 1978RB OUTLINE OF PTS HANDLING. The person is not to be put on any study actions or auditing actions other than those which handle PTSness, until such time as the PTS situation is handled. Unpublished work: © created 1997 revised 2003 CSI. This step is vital and must not be skimped or glossed over on any RPF member. (Ref: HCOB 31 Dec 1978RB II, OUTLINE OF PTS HANDLING) Note: A case which needs a full PTS Rundown is programmed according to HCOB 9 Dec 1971RE, PTS RUNDOWN, AUDITED. A) C/S PREPARED FPRD FORM ON THE SUBJECT OR AREA OF THE PERSON’S ASSIGNMENT TO THE RPF OR THE APPLICABLE FPRD FORM. 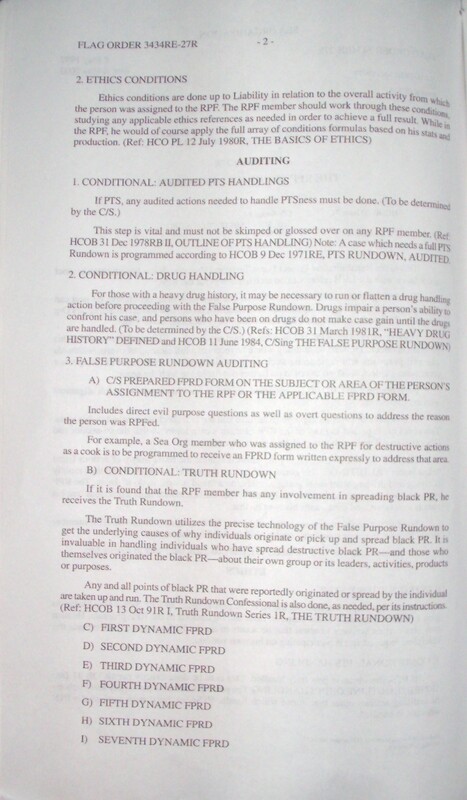 Includes direct evil purpose questions as well as overt questions to address the reason the person was RPFed. 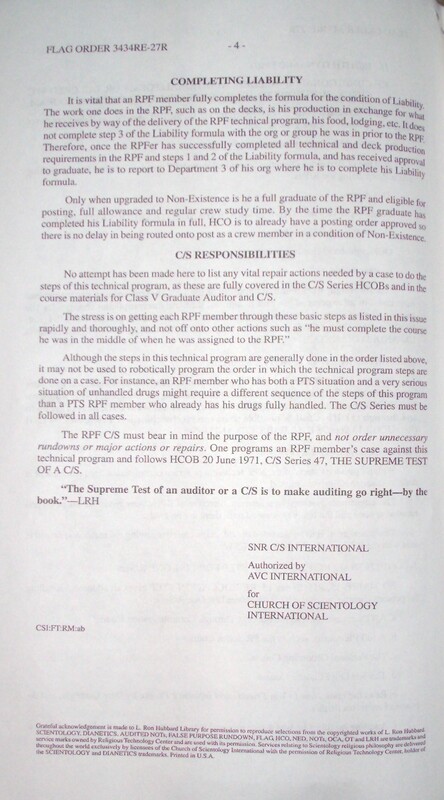 For example, a Sea Org member who was assigned to the RPF for destructive actions as a cook is to be programmed to receive an FPRD form written expressly to address that area. If it is found that the RPF member has any involvement in spreading black PR, he receives the Truth Rundown. The Truth Rundown utilizes the precise technology of the False Purpose Rundown to get the underlying causes of why individuals originate or pick up and spread black PR. It is invaluable in handling individuals who have spread destructive black PR—and those who themselves originated the black PR—about their own group or its leaders, activities, products or purposes. K) CONDITIONAL: IF NEEDED ADDITIONAL FORMS OR TAILORED SEC CHECK QUESTIONS TO ACHIEVE THE FULL EP OF THE RPF PROGRAM. The FPRD Basic Form is not directed for use on the RPF program as it does not cover a specific dynamic but is a general form. Full use of Expanded Dianetics is required if the RPF member is below Clear, is R/Sing and is dramatizing the R/Ses. With all previous steps of the RPF technical program completed, a final assessment is done to ensure nothing was missed. The assessment is issued in a separate directive to RPFs. Any reads are taken up and handled at once and the list is reassessed until there are no reads. This assessment is to be recorded on videotape clearly showing the meter and pc and is sent with the RPF member’s graduation CSW. e. Read the book How to Win Friends and Influence People by Dale Carnegie3, and do practical exercises on this. f. Auditing on times he was a nice guy and was successful at it, as follows: Recall a time you were a nice guy and were successful at it. : To F/N, cognition, VGIs, release. It is vital that an RPF member fully completes the formula for the condition of Liability. The work one does in the RPF, such as on the decks, is his production in exchange for what he receives by way of the delivery of the RPF technical program, his food, lodging, etc. It does not complete step 3 of the Liability formula with the org or group he was in prior to the RPF. Therefore, once the RPFer has successfully completed all technical and deck production requirements in the RPF and steps 1 and 2 of the Liability formula, and has received approval to graduate, he is to report to Department 3 of his org where he is to complete his Liability formula. Only when upgraded to Non-Existence is he a full graduate of the RPF and eligible for posting, full allowance and regular crew study time. By the time the RPF graduate has completed his liability formula in full, HCO is to already have a posting order approved so there is no delay in being routed onto post as a crew member in a condition of Non-Existence. No attempt has been made here to list any vital repair actions needed by a case to do the steps of this technical program, as these are fully covered in the C/S Series HCOBs and in the course materials for Class V Graduate Auditor and C/S. Although the steps in this technical program are generally done in the order listed above, it may not be used to robotically program the order in which the technical program steps are done on a case. For instance, an RPF member who has both a PTS situation and a very serious situation of unhandled drugs might require a different sequence of the steps of this program than a PTS RPF member who already has his drugs fully handled. The C/S Series must be followed in all cases. The RPF C/S must bear in mind the purpose of the RPF, and not order unnecessary rundowns or major actions or repairs. One programs an RPF member’s case against this technical program and follows HCOB 20 June 1971, C/S Series 47, THE SUPREME TEST OF A C/S. NCG means No Case Gain despite good and sufficient auditing. A chronically ill person, whether the person is known to be connected to a suppressive or not, is always found to have been so connected and PTS. IT IS UNSHAKEABLE POLICY HEREAFTER THAT NO PERSON WHO IS PTS OR CHRONICALLY ILL OR WHO GETS NO CASE GAIN MAY BE ON FINANCE OR REGISTRAR LINES OR IN TOP COMMAND POSTS OR AS HAS OR ETHICS OFFICER OR MAA. A person who is connected to a suppressive person, group or thing will dramatize a “can’t-have” or an “enforced overt-have” on an org or staff members. A “can’t-have” means just that-a depriving of substance or action or things. An “enforced overt-have” means forcing upon another a substance, action or thing not wanted or refused by the other. The technical fact is that a PTS person got that way because the suppressive was suppressive by depriving the other or enforcing unwanted things upon the person. The PTS person will dramatize this characteristic in reaction to the suppression. When staffs went on proportionate pay in the late 1950s, so long as I ran the orgs directly the staffs made more money than before. When I moved off these lines directly, the staffs began to receive less money personally. At that time it seemed to me that proportionate pay served as an excuse to some in an org to run a can’t-have on the staff. We knew that some Registrars could take money in easily and others never seemed to be able to. The technical reason for this has just emerged in another line of research entirely. In completing materials and search on Expanded Dianetics, I was working on the mechanism of how a PTS person remained ill. I found suppressives became so to the person by running a “can’t-have” and “enforced overt-have.” This pinned the PTS person to the suppressive. This research was in the direction of making people well. Suddenly it was apparent that a PTS person, as a robot to SPs, will run “can’t-haves” and “enforced overt-haves” on others. Checking rapidly, it was found that where finance lines were very sour a PTS person was on those lines. 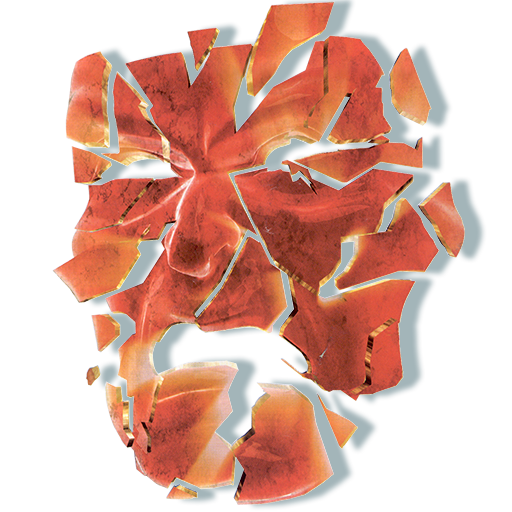 PTS tech, Objective Processes, PTS Rundowns, Money Processes and Expanded Dianetics will handle the condition. However, one cannot be sure that it has been handled expertly in orgs where a money “can’t-have” has been run as its tech quality will be low due to an already existing lack of finance. Only stats would tell if the situation has been handled fully. Thus the policy stands. Handled or not handled, no person who is PTS or who has no case gain will be permitted in top command or any lines that influence finance. Any org which has consistently low income should be at once suspect of having PTS or NCG persons on the key finance posts, and an immediate action should be taken to discover the PTS or NCG condition and replace such persons with those who are not connected to suppressives or who do get case gain. Nothing in this policy letter permits any PTS person to be in an org or cancels any policy with regard to PTS. This policy letter requires direct check, close investigation and handling of PTS or SP situations on these posts that may go undetected otherwise. NOTHING IN THIS POLICY LETTER PERMITS ANY KEY ORG POST TO REMAIN EMPTY. As a comment on something that may impinge on orgs and might affect them, the FOREMOST reason for a failing national prosperity and inflation is a personal income tax agency. This runs a vicious can’t-have on every citizen and makes them PTS to the government. Individuals even begin to run a can’t-have on themselves and do not produce. This IS the cause of a failing national economy. It can be a factor in an org and must be handled on the individuals so affected.